First of all you have to sign up for an Instagram account. Instagram allows you to sign up using either your phone number, email address or your Facebook account. And tadaaa you’re done. Studies have shown that 65% of audiences are more likely to remember posts when images are paired with the information. Instagram is like a gateway for your followers to window shop before purchasing from you. Its close to creating an online shop for free but not actually selling but more like showcasing your product/services. You can also share useful information on how to use a product/service through posting on Instagram. That’s what’s great about Instagram! Not only can you post pictures but you can also give your customers a detailed explanation of the product/service in the picture in the caption. You can use this social media platform to get more personal and share pictures of your staff, office or what your company does everyday. Use photos to share how your products are made or services are carried out. Customers often like to see where their products/service are coming from or even WHO is carrying it out for them. You can also share pictures of the FUN that happens in the office. (example: birthday celebrations, company anniversary, someone joining the team). Instead of using it to only sell your products/services, use it to create a bond between you and your customers. As your followers will feel like they have an insight of what’s going on in the company. Hashtag’s are the new in thing when it comes to social media. Every platform has it and EVERYONE is using it! Especially online businesses in Malaysia! Use it to reach a wider crowd (reaching more customers), to create a community for your customers to share and communicate with one another (keeping customers loyal) and of course make it easier for you communicate with your customers too (keeping customer’s trust). *Check out our Infographic on Social Media Marketing Tips for more on hashtags. Why not? It will look super cool on your website! The main purpose of this is so that it can capture the attention of your visitors and for them to stay on your website long enough that they are convinced into buying something from you. Many eCommerce sites today often just link their social media sites at the bottom of their page and when customers click on it they will be redirected to their Instagram page. This will probably cause viewers to get lost in all the content and forget about your actual website. The most effective way to showcase your social media site to your viewers without having them leave the actual website is to have your Instagram page integrated onto your website. It is also a form of proof that your site is still active which many viewers feel more secure when buying from an active site rather than a dead one. At this point you’re probably wondering how? 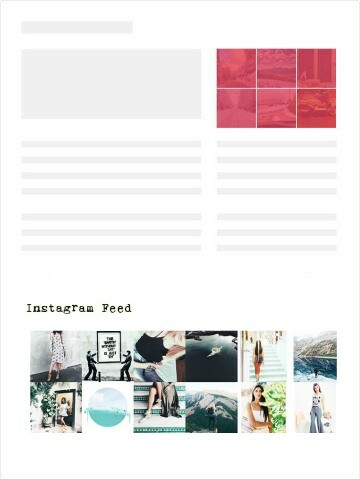 How do you integrate your Instagram feed onto your website. Let us at Instantestore do it for you. To our existing merchants if you didn’t already know we can help you integrate Instagram into your website giving it that cool, young and edgy look. ps: The picture is only an example. We can customize your Instagram feed to fit into anywhere on your webpage that you would like.